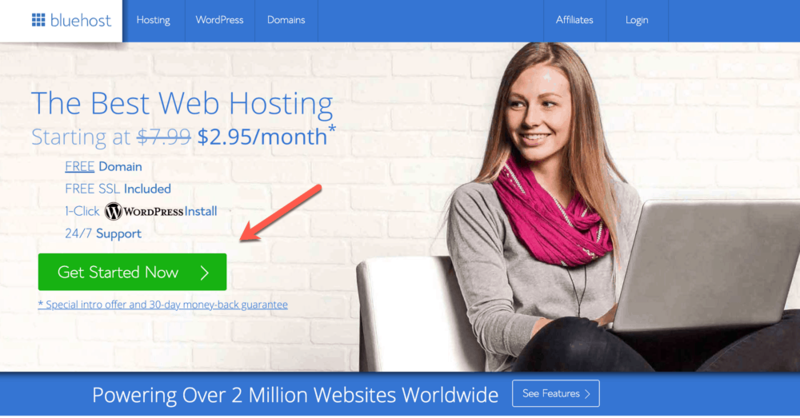 Bluehost is one of those WordPress Webhost that I recommend. It’s not only one of the best Dreamhost alternatives but also one of the best hostings in the battle of Hostgator Vs Dreamhost Vs Bluehost. We recently partnered with Bluehost to offer special Bluehost $2.95 promo link. Bluehost is one of those professional Web hostings who never over sales their server and that make sure your site remains up. Bluehost offers various shared hosting packages and if you want to know, which one is right for you? Which Bluehost Shared Hosting package is best for you? To host a WordPress Website, Bluehost is the best-hosting company. Before we move ahead, let me talk about this Bluehost deal. This Bluehost discount can only be used using this link. You need to sign up for 2 or 3 years hosting plan to enjoy the $2.95/month special discounted pricing. If you are signing up for only 1 year, you will be paying $4.95/month. I have used Bluehost many times, and few of my existing WordPress client are also using it. Bluehost can easily handle traffic up 12000-15000/day on a WordPress site. Make sure to use Cloudflare (free) and any good cache WordPress plugin along. 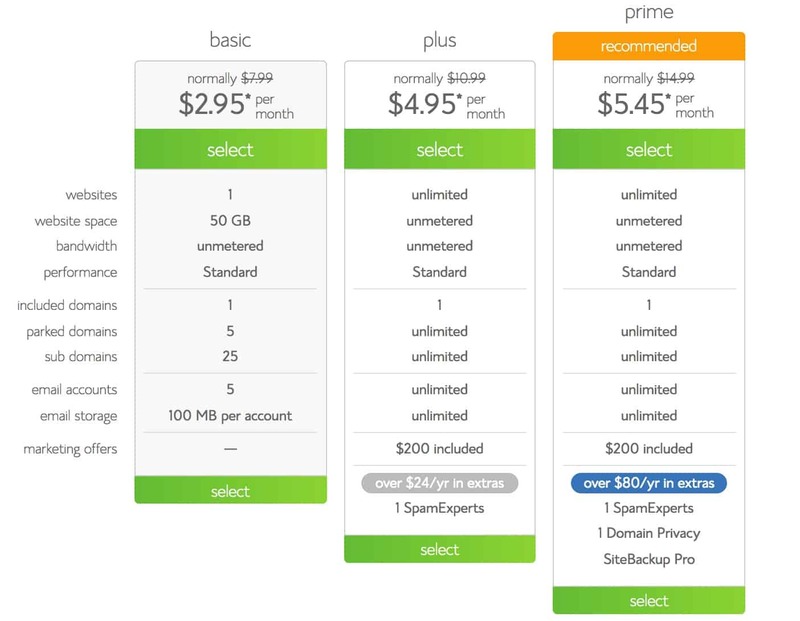 Bluehost offers 3 different packages under shared hosting. I would recommend you to buy Plus hosting package, as it let you host multiple websites & is most popular among all. 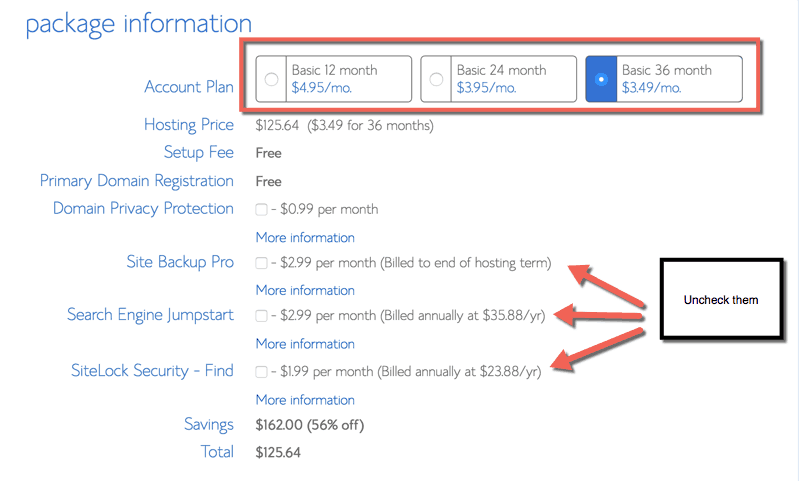 When you sign up for Bluehost, you get a one-year free domain. You can also sign up with an existing domain, and later on, you can buy one domain for free from Bluehost cPanel. Also, if you are new to Bluehost hosting, it will let you host multiple Websites on their shared hosting plan, and this Bluehost discount makes it an affordable hosting when you are buying for 2 or more years. Using this discount offer is easy. All you need to do is follow the link given below and go to Bluehost homepage. Click on get started now & on the next page select the package you wish to purchase. Basic plan: Good for hosting one website. Plus package: Host up to 10 websites. I usually recommend this one as the price difference is not much & in future, you would be able to add more site without any extra cost. Bluehost Prime package: This package is recommended when you need to use Dedicated I.P (For e-commerce sites). Note: All the plans come with one-year free domain name. So you would be saving an extra $12. After selecting the package on the next page, you can either claim your free domain or use your existing domain name to signup. And select the domain name, plan period and your account will be set up within minutes. To enjoy the maximum benefit of this Bluehost $4.95 discount, sign up for a minimum of 2 or 3 years. Enjoy this special Bluehost discount and do share it with your friends who need web-hosting. If you have a question regarding this promo code, do let me know.